Microbial cellulose is cellulose produced by bacteria. Traditionally, cellulose comes from plants, such as trees and cotton to name a few. Anselme Payen a French chemist discovered plant based cellulose in 1838 and as early as 1870 the Hyatt Manufacturing Company began polymerizing cellulose. Cellulose forms the basis of paper products, textiles, and even many modern materials like rayon and cellophane. Unlike plant cellulose, microbial cellulose is produced by bacteria the most common being Acetobacter Xylinum. At a microscopic level the two forms of cellulose (plant v. bacterial) appear quite different and this is why they perform so differently. Microbial cellulose is much finer in structure, the fibers are longer and stronger. The environment of the bacterial culture can be controlled to produce many variations of cellulose, each with its own unique characteristics. Once collected the cellulose can be polymerized lending to infinite applications. Potential products range from electronic paper, filters for hydrogen fuel cells, to heart stints, synthetic Dura mater, Scaffolding for engineered tissue, and wound care dressings that function much like an artificial skin, and an infinite number of medical and nonmedical products. An excellent review of the properties and uses for microbial cellulose can be found in a position paper written by Dr. R. Malcolm Brown, Jr. The electron microscopy below demonstrates how microbial cellulose is nearly identical to the body’s own tissue. 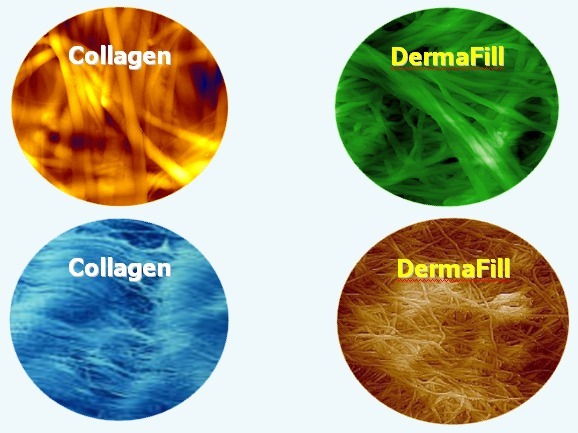 The spaghetti-like network of fibers found in our collagen is indistinguishable from the microbial cellulose found in DermaFill. It is for this reason that DermaFill exhibits its exclusive properties and works unlike any other dressing. Microbial cellulose creates a scaffold like the body’s own tissue which allows for the migration of healing cells across the entire bed of the wound. The unique structure also has a pore size equal to the skin assuring proper moisture content in the wound while allowing oxygen to penetrate the dressing at the same time as it protects the wound from bacteria.